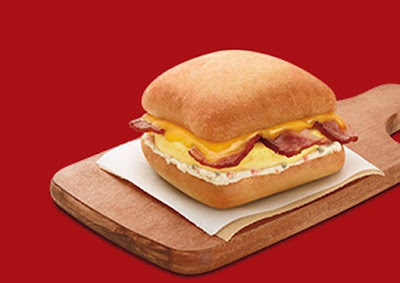 7-Eleven offers a premium version of their standard breakfast sandwiches with new Breakfast Melts, which come on a toasted ciabatta bun rather than a biscuit or English muffin. Available at participating stores (basically those with a turbo convection oven), Breakfast Melts come in two varieties: Bacon, Egg & Cheese and Sausage, Bacon & Cheese. Bacon, Egg & Cheese features thick-cut, hickory-smoked bacon, egg, garden vegetable cream cheese, and aged cheddar cheese on artisan ciabatta bread. Sausage, Bacon & Cheese features thick-cut, hickory-smoked bacon, maple-flavored sausage, and aged cheddar cheese on artisan ciabatta bread. Prices for 7-Eleven's Breakfast Melts start at $2.99. The breakfast sandwiches follow a trio of Melt Sandwiches that were first introduced last year.